Before describing the P12 camera series we wanted to say that we take the issue of using covert video surveillance and the potential violation of people’s privacy VERY SERIOUSLY. We believe it is incumbent on all of us to consider both the legal and ethical issues raised when using covert surveillance. There are situations where the use of discrete or covert cameras can provide significant additional security to people and property, but there are also many situations where we will decline to participate in a client’s request to install a covert surveillance product. To read more about the possible uses of covert surveillance and our thoughts on the ethical issues raised please see our article Covert Video Applications. The Axis P12 series is comprised of miniature high definition cameras designed for discreet or covert applications. Despite their small stature they have the same robust features as many full sized Axis cameras including 720p HD resolution, an SD card slot for on-board video storage, POE power, input/output connectors and video motion detection. This is made possible by placing all of the storage and communications in a separate module connected to the camera by a cable. The model P1204 comes in a discreet surface mounted housing. This makes it ideal for mounting at eye level next to a door, or just above the door looking down. Building exits are excellent locations for capturing detailed facial images as people are forced to walk right by the camera as the leave. The P12104’s diminutive housing can blend in more easily with the surroundings than a standard camera, or even a mini-dome housing can. 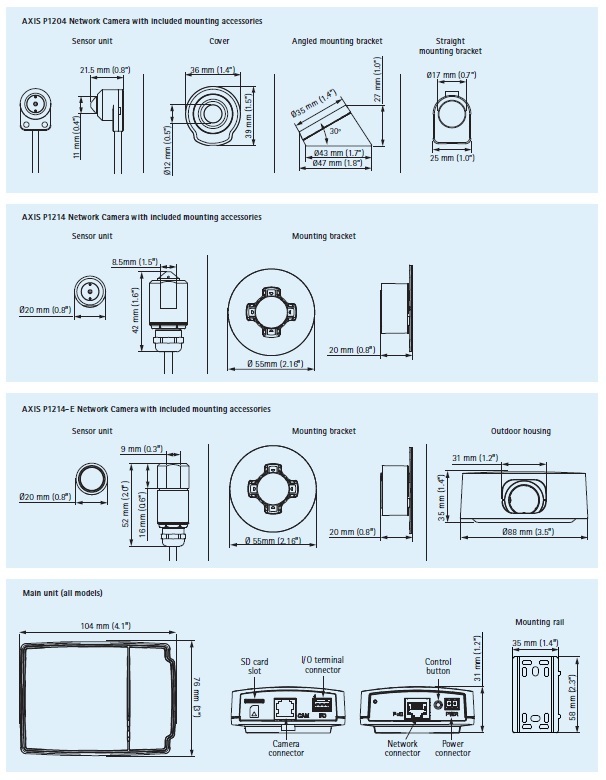 The P1214 can be completely hidden behind a “pinhole” opening in a wall, ceiling, cover plate or within a device such as an ATM machine or thermostat. The camera comes with a cleverly designed self-adhesive mounting bracket allowing you to position the camera precisely and tightly against the surface the camera is hidden behind. The P1214-E is designed for semi-covert applications and can be located outdoors. It comes with an additional “puck” shaped housing to help protect the camera and to provide additional mounting options. All 3 cameras have a 2 part design, a small camera “head” connected by a 26′ cable to a module that contains the processor, connectors and SD card slot. When using Axis Camera Companion software and an SD card for video storage this adds a layer of security, especially for outdoor applications. If the camera head is damaged or destroyed the video footage will still be safe within the module. 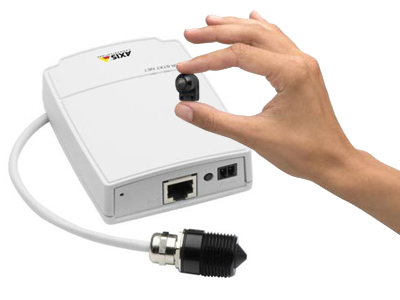 The cameras are POE powered requiring only one cable for power and data transmission which reduces installation costs and keeps wiring tidy. They can even be installed right on your existing data network infrastructure with no additional cabling required. Click here to view the Axis P-12 series camera brochure. The video below demonstrates several covert applications for the P12 series cameras. Maximum resolution: All models = 720p (1280 x 720 resolution). Lens: P1204 /P1214 – 3.7mm , providing a 57 degree horizontal angle of view. P1214-E – 2.8mm , resulting in an 81 degree horizontal angle of view.